LYNNFIELD-Mary Waselchuk, Realtor formerly of Century 21 North Shore, joined Northrup Associates as a new associate with Northrup effective in January. Waselchuk has 18 years of experience in the real estate industry. "Northrup Associates is pleased to recognize and welcome respected veteran Realtor Mary E. Waselchuk," said Northrup Associates owner Richard Tisei. "Mary's competitive intelligence, professionalism and dedication have made her a valued and trusted real estate resource for the Peabody community and we anticipate her to be a major contributor to the overall success of Northrup Associates as a whole," Tisei said. Waselchuk has received several awards for er achievements in real estate, including the Masters Club Diamond. 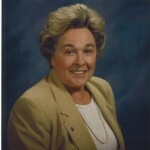 A lifelong resident of Peabody, Waselchuk served on the City Council for 16 years, and was the first woman to serve on that body. She had been married to John Waselchuk for 54 years, has two daughters, Ellen and Janet and four grandchildren.